Sharron Mangum and Marietta Goodman aren't the only racial discrimination victims who opted out of the class action racial discrimination lawsuit, Ingram, et al. v. The Coca-Cola Company, who felt they had been misrepresented and swindled by Willie Gary. 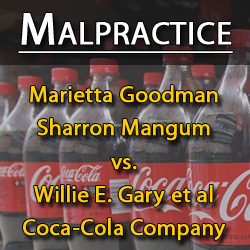 However, both Ms. Mangum and Ms.Goodman wrote affidavits describing dialogue between Ms. Mangum and attorney Michael Johnston from Coca-Cola's law firm King & Spalding during a deposition of Ms. Mangum, which Ms. Goodman witnessed. 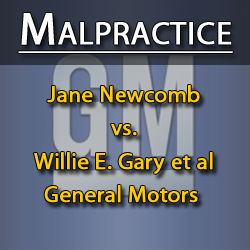 During the deposition, there was a line of questioning that seemed to indicate that Mr. Gary had received settlement monies for Ms. Mangum which she was never made aware of by Mr. Gary and never received. 1. My name is Sharron Mangum. I am over the age of 18 years. I am fully competent in all manners, and for all times herein relevant, have been competent to make this Affidavit. The information contained in this Affidavit is within my personal knowledge, and is true. 2. July 15, 2004, I appeared at King & Spalding, LLC, 191 Peachtree Street, Atlanta, Georgia 30303 for a scheduled deposition in the matter of Civil Action File No. 1:01-CV-2866 (RWS). Ms. Marietta Goodman ("Ms. Goodman") personally appeared as a witness at my request that same date. 4. 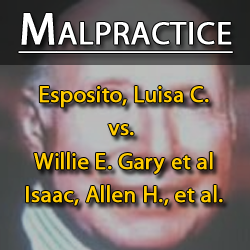 The deposition began at 9:00 am and continuing thereafter until on or approximately 6:00 pm that same date. 5. Present, for this said deposition, for the defendant, The Coca-Cola Company (hereinafter, "Coca Cola"), were Attorney Michael Johnston ("Attorney Johnston") and Attorney Darren Shuler of King & Spalding, LLC, 191 Peachtree Street, Atlanta, Georgia 30303 and Attorney Elizabeth Finn Johnson ("Attorney E. Johnson") of The Coca-Cola Company, One Coca-Cola Plaza, Atlanta, GA 30301. 6. Also present were a Court Reporter, Ms. Cornick and a Videographer of Brown Reporting, 1740 Peachtree St., NW, Atlanta, GA 30309. 7. 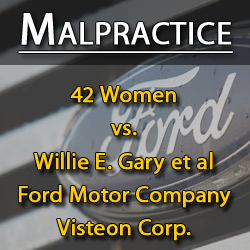 At one point during my deposition, Attorney Johnston began a line of questioning in regards to my receipt of settlement funds from Willie E. Gary, Esquire, of Gary, Williams, Finney, Lewis, Watson, & Sperando, PL, 221 East Osceola Street, Stuart, FL 34994. 8. Attorney Johnston specifically asked me if I received any settlements funds from defendant Coca Cola from my attorney, Willie E. Gary, Esquire, to which I responded, "No". 9. 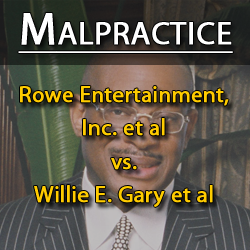 Upon being asked the specific question as to whether I had received any funds in the form of settlement monies from my attorney, Willie E. Gary, Esquire, for the pending Coca Cola employees lawsuit, I was perplexed and startled for a few moments, and with a puzzling tone of voice, I answered, "No". 10. A second time Attorney Johnston, specifically by direct question, asked me, "You didn't receive any money from Willie Gary"; to which, I again clearly responded, "No". 11. A third specific question from Attorney Johnston, asked, "So Ms. Mangum, you're telling me that you didn't receive any money from Willie Gary?" And, again, I clearly and unmistakably responded, "No!" 12. Mr. Johnston turned to Ms. E. Johnson and gave her a look of what appeared to me to be disbelief; and turned back to me and said, words to the effect that this is something that I needed to take up with Attorney Willie Gary. 13. 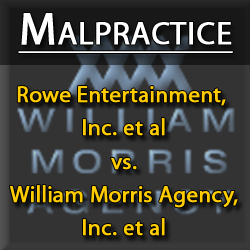 I specifically asked defendant Coca Cola's Attorney, Mr. Johnston, if he was saying that Coca-Cola had paid Attorney Willie Gary in settlement of my case, to which Mr. Johnston responded words to the effect, that he was asking the questions here. Marietta Goodman, in her affidavit, confirmed the account given by Ms. Mangum in her deposition.